Save Fuel and Extend Engine Life 100% to 150%, for less than a penny per mile! The easiest, fastest, least expensive way to clean the inside of an engine... period! Why spend $100's of dollars on chemicals for the oil, fuel, transmission, or rear end, when none of them can remove metal? Simply drop two SAE tested and certified "Ceramic Magnet" into a new oil filter and spin it on. Magnet locks to inner wall and can not be dislodged. You are now enjoying the power of a "super filter" that is "40 times" better that when it came out of the box. No filter, no matter what the name, can remove metal and contaminants better than this set up! Guaranteed! How about this for.... "Seeing is Believing"
Note: Picture is highly magnified, to show micron size particles. so particles that cause all the damage (10 microns and smaller) are nearly invisible. 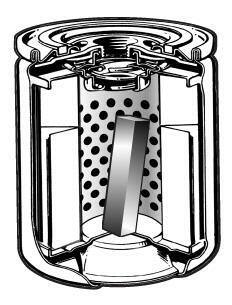 When a GWR ceramic oil filter magnet is installed, you "instantly" start eliminating what the oil filter does not! Note that the average oil filter removes only 5% of the circulating particles of metal and harsh chemicals under 20 microns, leaving 95% to wear the internal parts. SAE tests #881827, #881825 & #952555; GM/AC Delco testing and Independent Lab testing (see tech details below) proved that by removing particles between 10 and 20 Microns (what filter does not get), you virtually eliminate oil induced friction and increase engine life by 200%, 300% 400% and more. note that the engine life expectancy is increase by factors of up to 8 times (or 800,000 miles). Improved oil filtration has been scientifically proven to dramatically decrease engine wear. FACT: Filtering contaminate particles down to the "1 Micron" level can extend the life of lubricated engine parts by a factor of up to eight. Even though few people are going to keep their personal vehicle for 800,000 miles, there is a big difference in the performance of an engine at 100,000, 200,000 and even 300,000 miles when it has been protected by our filter magnets. Because component wear has been minimized and tolerances remain tighter... fuel economy, oil consumption, compression and performance are maintained a nearly new specifications for the majority of its life. If 10 Microns is GOOD, what is near ZERO worth??? Note that with our magnets you don't just remove particles above 10 Microns as in the SAE tests, you eliminate particles down to 1 Micron and even smaller. That is a "10 times" improvement over the SAE test base! This incredible drop in particle volume significantly passes a known friction threshold (see below) and SAE testing confirms fuel consumption is decrease by a minimum of 3.5%. With today's $3 per gallon gas prices, the magnets are really FREE!!! You will easily receive back 2 to 3 times their cost, in gas saving alone! About now you may be thinking... " Snake Oil! " I use and oil additive so I don't need a magnet. Even if an engine has been treated with a liquid additive like Pro-Long, Dura Lube, Slick Fifty, or other chemical additive, they will not replace the benefits of a GWR Oil Filter Magnet. Friction reduction, not metal removal, is the claim of most over the counter additives. In reality, they mainly add lubricity during the first few seconds of engine start up, when pressure is building and the oil has not yet reached the moving engine components. Unfortunately, after start up they don't do much to control wear because they can't capture floating particles or eliminate new particles from forming in the engine. Floating particles in an engine act just like liquid sandpaper and cause wear to increase proportionally, as the mileage increases. Even changing to Synthetic Oil will not eliminate the need for an oil filter magnet. Metal particles come off internal engine parts every day, for years and years, no mater what type oil or special additive is used. The only way you can remove micron size particles, reduce wear by 300% and improve gas mileage... is to install a GWR Oil Filter Magnet!!! Lower Risk of Oil Oxidation Too! Iron and steel particles are known to promote oil oxidation by their catalytic properties. Premature oil oxidation can lead to varnish, sludge and corrosion. Everything else being equal, the continuous and efficient removal of iron and steel particle by magnetic filters should have a positive impact on oil service life, and over time, reduce oil consumption if oil is changed on condition. Unlike conventional filters, most magnet fitted filters exhibit little to no increase in flow restriction as they loads with contaminates. While conventional filters can go into bypass when they become plugged with particles, magnetic filters (including mag-plugs and rods) continue to remove particles and allow oil flow. Of most concern, diesel and gasoline engines provide no indication of a filter that has gone into bypass. In such cases, the oil may go for an extended period of time without being filtered. Common causes of premature plugging of engine filters include coolant leaks, poor combustion, poor air filtration and overextended oil drain intervals. No engine should be run without an Oil Filter Magnet! Although the above oil filter magnet claims sound impossible, every one is backed by either the SAE Testing, US Gov/Military Testing or a Certified Laboratory Tests by major oil companies, subsidiaries or independent labs (please see details below). Oil Filter Magnets work and the technology is 100% Guaranteed SAE Safe!! Wait, isn't it better to put a big wrap around magnet on my oil filter ??? Well if you're comparing an expensive wrap around oil filter magnet to our patented internal magnets, please consider this. you will pull tons of metal out of your oil. The media paper in your oil filter could have done the same job for free! Yikes! You just spent $50 on their fancy looking magnet for nothing. wrapped in an external Filter Magnet type product. Where is all the loose metal deposited? You are being tricked by these types of photos because they show the larger metal particles that have not reached the oil filter element yet. Remember that if you can see metal it is larger than 50 microns, so all of those loose chips of metal would have been caught by the paper media. Truth is you should never collect metal before it passes into and through the media. What you want to collect with a magnet is any particles that are so small, they go through the media! The ones that are 5, 10 or 15 microns, the ones the SAE documents discussed below say are responsible for 80% of your engines wear and breakdown. A more important issue is engineering! The wrap around products are in direct conflict with the technical design an OE Filter manufacturer builds into their new products. 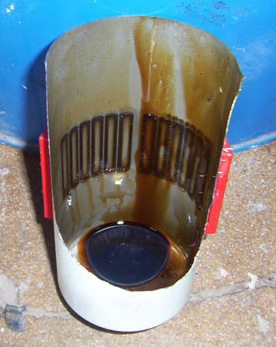 Note in the pictures above that oil flows from the outside to the inside of the filter. Next note the limited space between walls and media paper, it is extremely tight and narrow. Now note where the ragged, rough large metal particles are deposited when external wrapped magnet systems are used. They all end up in nice little rows along the inner wall of the filter's metal shell. Well those walls are factory finished with high tech paint like coatings that seal and smooths the raw steel, so it is a virtually zero friction component. FACT: The faster and easier the oil flows up the side wall and then into the paper media, the less Horse Power (ie Gasoline) it takes to push the oil through lubrication system. For the techies in the group... here is what you are looking for! Lube oil contamination accounts for seventy to eighty percent of all failures and wear problems. The wear process promoted by oil contamination leads to diminished fuel efficiency, shorter useful oil service life, increased engine down time, reduced component life, loss of engine performance, and an overall increase in operating costs. Contaminant particles responsible for this damage are in the size range of the dynamic lubricant films separating moving engine component surfaces... 10 microns and smaller. Typically these particles pass through the oil filter and continue to build up in the oil system. By making simultaneous contact with opposing surfaces these harmful particles focus the load onto a small area, degrading the surface and perpetuating a chain-reaction-of-wear. 3. Gaseous contaminants, including acidic combustion products, which corrode component surfaces and degrade the oil. The predominant harmful impurities in engine oil are metallic particles and metal oxides. Typically there are well over 10,000 contaminant particles per milliliter of lube oil. Furthermore, approximately 90% of these particles are less than 10-microns in size. It's important to note that these particles generate about 3.5-times more wear than particles greater than 10-microns in size. This wear occurs because these particles are the size of, or slightly larger than the dynamic oil films separating opposing surfaces. Numerous studies have established a number of important points regarding the relationship between lube oil contamination and engine wear. 4. The lube oil service life to be more than doubled without adverse engine wear or lubricant degradation. In summary, controlling particle contamination in the 1-10 micron size range retards the chain-reaction-of-wear, resulting in significant reductions in component wear and lubricant breakdown. The beneficial consequences include greater component life and reliability, increased oil change intervals, increased fuel efficiency, and a reduction in overall maintenance costs. 1. Upper & Lower rod bearings. 3. Compression & oil piston rings. Conclusion: Control of particles in the 3-10 micron range had the greatest affect in reducing engine wear. It was found reducing contamination from 0.016% by weight (standard oil filter) to 0.0025% by weight (extended filter / 10 micron control), reduced engine wear by a factor of 14. Most significantly, oil friction was reduced by 2.9% compared to operating with clean oil. This reduction was equated to an increase in fuel economy of about 4%. As a comparison, this significantly exceeds the 0.6 - 0.9% fuel economy gain experienced when converting from SAE 40 to multi grade lube oil. Samples of 138 engines operating with standard paper filter were compared to 117 engines operating with upgraded 10-micron filters. Based on the relationship difference between dynamic oil film and size of wear generating particles, the most important particle size range is 0-10 microns. 1. Diesel engine lube oil contamination causes wear of engine components. Wear of these components leads to loss of performance, increased maintenance and overhaul cost, lower fuel efficiency, and shorter lube oil service life. 2. There is a fundamental relationship between the size of contaminate particles and the thickness of the dynamic oil films developed between moving surfaces of active components. Particles the size of, or smaller than, the oil film thickness cause wear of components. By making simultaneous contact with both surfaces, these particles focus the load onto a small region of the surface, resulting in surface pitting, plowing, and cutting. 3. The average oil film thickness associated with the majority of diesel engine components is in the 7 to 10 micron size domain. This is the size range of the most damaging contaminant particles. In addition, mechanical stress is accentuated during the high-load/thinner oil film phase of the engine cycle. In order to minimize engine wear, emphasis must, therefore, be placed on controlling particles in the 10-micron size domain and smaller. a) Higher friction, leading to high fuel consumption. 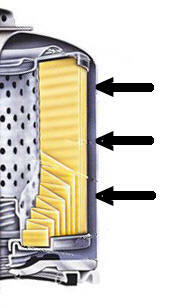 b) Loss of material from sliding and rolling contacts, resulting in misalignment, vibration, and component replacement. c) Opening of piston dynamic sealing surfaces, leading to loss of compression, further fuel consumption, and contaminant ingestion from the environment. d) The accumulation of soot and combustion products in the lube oil and the formation of lubricant breakdown varnishes and sludge leading to reduced oil service life. a) An 8 to 14 times reduction in engine wear. b) Up to 2 times increase in oil service life. c) Up to 2 times increase in filter service life. d) Up to 5% improvement in fuel economy. The ultimate benefits are greater diesel engine performance over extended life with lower operating cost. The subject was a Peterbilt engine (CAT C12) using a Premo LT-30P oil filter system equipped with a 1.2 micron filter. A baseline test was performed at an interval of 15,000 miles as indicated on the Analysis Report dated 4/11/01. Ceramic Oil Filter Magnets were then inserted into the oil filter. After 15,000 miles, the second test was performed on 4/30/01. Please note the dynamic improvement in ferrous particle reduction (in PPM), but also non-ferrous materials/contaminants by the process of heterocoagulation. Final column is percent of change from 1.2 Micron super filter system that costs over $250 and is 25 times better than any standard street vehicle filter. Oil analysis report measuring parts per million (PPM), particle size 0.5 microns. Even Non Ferrous (Non Magnetic) particulate are pulled in by our Oil Filter Magnets! 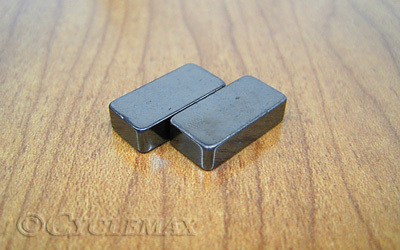 is why you can improve fuel economy if you include an Oil Filter Magnet in every oil change. An 8 to 14 times reduction in engine wear. Up to 2 times increase in oil service life. Up to 2 times increase in filter service life. Up to 5% improvement in fuel economy. The ultimate benefits are greater engine performance over extended life with lower operating costs and higher resale value. GWR Oil Filter Magnets can be added to virtually any oil filter and control particle contamination down to 0.5-microns. This is a 20-times improvement in particle control as compared to the SAE Technical Papers that indicate substantial wear reduction and fuel improvement by control down to only 10 microns.